Kyle and I just filed our taxes! Phew, got in right under the deadline. I drafted them a couple months ago using TurboTax and I think I did nearly everything right because Kyle only had to make one edit when he checked through it. We owe $67 in federal taxes and are getting $278 back from NC, so I think we played that pretty much exactly right. I am really happy that the standard deduction exists. Our only eligible deductions are our charitable contributions, which are nowhere near $11,600 per year. After all the media coverage of the presidential candidates’ effective tax rates and giving rates, I thought I would check up on our official 2011 rates (not just what shows up in our budget). I was surprised to find that our federal effective tax rate is 8.03% and our state effective tax rate is 4.63%! Wow – that’s really low! Don’t be jealous though – think about how much we earn to qualify for those rates. We also paid a 0% tax rate on our capital gains/qualified dividends, which I didn’t know was possible. This was the first year we had any income of that sort so it was a new area for us to figure out. 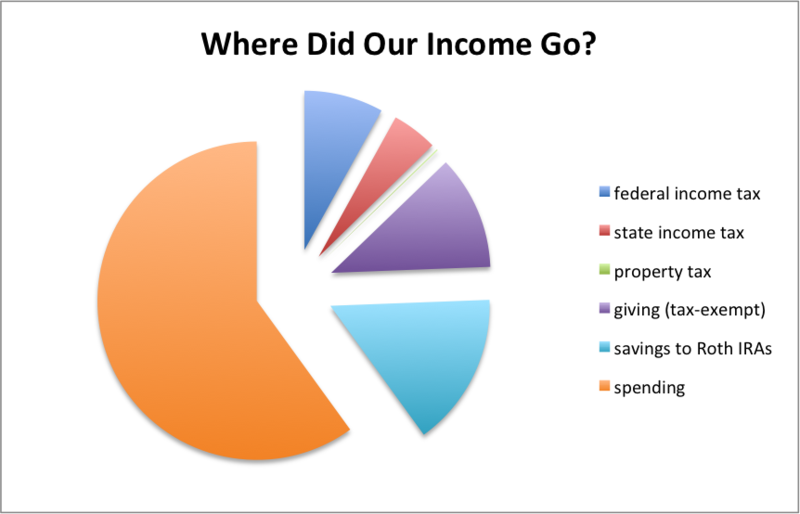 Our taxes, giving, and retirement saving add up to just under 40% of our income, which means we lived on 60%. (Actually, we spend a little more, since we receive some gift money as well.) That sounds pretty good, right – to live on 60% of what you make? I suppose in the future we’ll live on an even smaller fraction as our tax rates increase and we continue to save and give a minimum percentage. 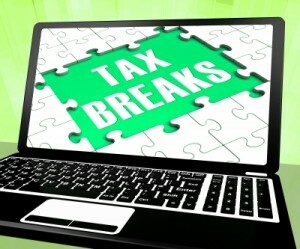 Did you calculate your effective tax rate this year? Were you pleased or disappointed with the result? What overall portion of your income did you spend (aside from taxes, giving, long-term saving, and debt payment)? Did you find out anything else from your taxes that surprised you? 25 Responses to "Tax Time! What Are Your Rates?" When you say “effective tax rate,” you mean your (tax due)/(total income), correct? or (tax due)/(taxable income)? Well, in our case all of our income is taxable, but the total is before any deductions or credits. Just total total. I hope that’s the correct use of the term! Yep, that clarifies it. Our state rates are a little tricky, since we lived in one state, but worked in 3. federal = 8.65%, state (cumulative) = 4.44%. I’d never calculated my effective tax rate before, but I guess it’s lower than I expected. Paying off student loans, and applying the Lifetime Learning Credit made a big difference. Taxes for us have become more and more complicated each year, but I, too enjoy the process. I learn a lot, but never enough to make the next year’s filing completely pain-free! After my couple years of living/working in two states I’ve had several easy returns in a row. This is the first year they’ve gotten more complicated because of our investments. I think 2012 will be another easy year and then things will get really crazy. I was shocked when I calculated my rate a couple of years ago. I didn’t look to see what it was last year but I’m guessing it’s pretty low compared to what it should be. We always have a TON of write-offs. I like your little pie chart detailing where the money went. That’s really interesting! WorkSaveLive recently posted..Should I Sell My Wife’s Wedding Ring? We don’t get very tricky with our taxes. Just the standard deduction. We were pretty miffed this year that we couldn’t use the Lifetime Learning Credit for the laptops we bought last summer. Apparently since our university doesn’t have an official written policy that all students must have laptops we can’t take the credit, even though in practice we both use our laptops at work on a daily basis, and I’m not provided any other computer for my personal use (Kyle is). Grrrr (at least for me). Thanks! In Mint I usually only look at spending breakdowns in pie charts so I thought it would be interesting to see the whole picture without delineating spending categories. I get taxed about 25-30% in both provincial and federal tax. It’s expensive. I’m a student so my tuition gives me a tax credit so that’s a bonus, but it wont be for long! I think (hope) tax rates in the US will increase too. The national debt is really troubling. our effective federal rate is 10.22% and our NC effective rate is 6.34% — both are down a bit from last year – helps having a hubby in school! Very precise – I would expect nothing less! I think I paid around… $13,000-$15,000 in taxes 2011 (can’t remember the exact figure). It’s about 14%-15% of my total gross income and a bigger percentage (around 20%?) of my adjusted gross income. That’s with me maxing out the 401K and putting 25% of all freelance income into a SEP IRA. Standard deduction. That’s cool you set up a SEP IRA for your blog! Doesn’t sound like such a bad overall rate after all your pretax contributions. My withholdings are a little slim, too, even though I thought I filled out the forms correctly. When I was single I had to pay extra in April but Kyle’s withholdings balance mine out pretty well. My effective income tax rate was about 19% or 17% if you include 401(k) contributions in income. Between maxing out the 401(k), the standard deduction, and the personal exemption, that really lowers me down in the tax bracket, wow! I think that the spent/saved amounts are pretty good! I can’t believe that my overall income tax rate is that low though – that seems a bit crazy. Leigh recently posted..Update on the 2012 Clothing Spending Plan: Shoes! Wow, that is an insane savings rate! Great job! When I heard your tax rate I was shocked. Then I looked at your pie graph and saw it as a percentage of income….and it looks much better. I laughed when I sat down to comment because I totally procrastinate on my taxes every year, and I’m not a procrastinator! I am self employed and owe money to the government, so you’ll usually find me at 11:30 pm Tuesday night in that “last minute” line as I’m dumping my check into the mailbox. I should have been more clear – the dollar amounts I listed were additional tax due and refunded, not our total bill. We are complete procrastinators and I was impressed that we finished it up before the 17th this year. I wasn’t eager to file since, as you see, we weren’t getting a federal refund either, or enough from the state to get excited about. I don’t even know my tax rate but yours looks really nice! Congrats on finishing your taxes – and getting a small refund back. It wasn’t hard to calculate – two lines out of the 1040 and one from the state forms. I’m not sure what we’ll do with the $200 yet. Kyle needs some new dress shoes badly and I need new sneakers. We’ll probably buy those and put the rest of the money in our nest egg.